E.M Forster wrote A Room With A View about vacationing Brits and romance at the turn of the last century. The story is set in Florence and starts with a complaint about the room not having the right exposure. It overlooked the courtyard instead of the beautiful city as had been promised. Pension Sacher in Vienna does not have to promise a view. Located in the heart of Vienna on Rotenturmstrasse, all the windows expose a glorious sight of the cathedral, Stefansdom, day or night, and the happenings in the square below. A business colleague discovered the pension for me in 1994 on my first visit to the city. I have since stayed at another pension only one time, and regretted it. The pension occupies the 7th floor of a '60s building dedicated to John F. Kennedy. All the rooms (actually suites or apartments) come with a kitchenette, spotlessly clean and decked out in antiques. The pension has been a "home" in Vienna in the 3 times I had been there (1994, 1996, 2010). It hasn't changed a wee bit over the years. Across on the side street is the Bristol if one cares to go 5 star. 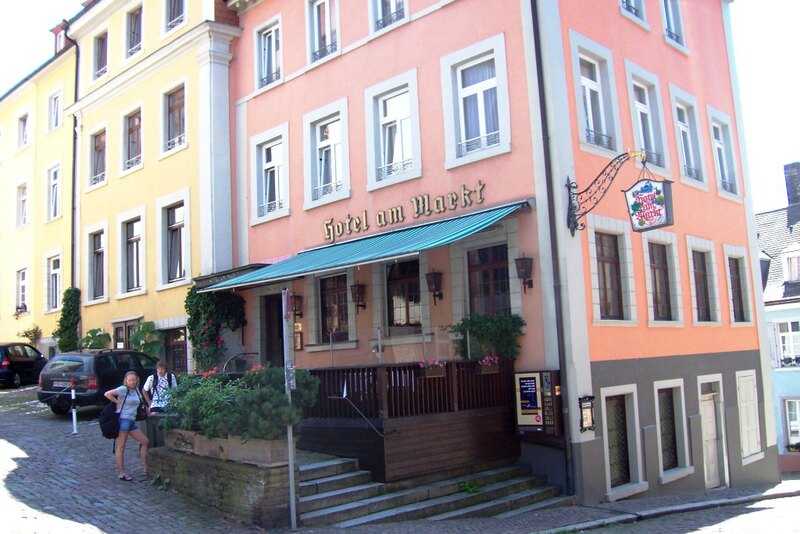 Hotel Am Markt in Baden-Baden, Germany is another one of those little gems that offer every room with a view. 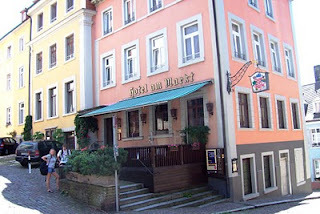 Set on a hilltop in the old town across the Catholic Stiftskirche, the rooms of this 250 year old and immaculately kept pension look out onto the old square and the church, the quaint downhill side street with equally quaint buildings (e.g. the town hall), or a view of Baden-Baden. My first time, in 2002, I checked into a single room, with wash basin and shared bathroom, facing the side street. (Who needs a bathroom when one can get clinically clean next door at Friedrichsbad or down the street at Caracalla?) Another time in 2006, it was a larger room with windows exposing the city, and in 2007, a large suite looking out to the town hall. A sumptuous German breakfast buffet taken in a leisurely pace completes the picture. Pension Sacher and Hotel Am Markt are most likely found in every guide books and online travel websites. They're probably rated 5 stars, as in highly recommended.